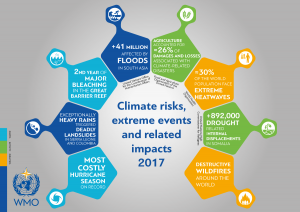 March 23, 2018 – The very active North Atlantic hurricane season, major monsoon floods in the Indian subcontinent, and continuing severe drought in parts of east Africa contributed to 2017 being the most expensive year on record for severe weather and climate events. 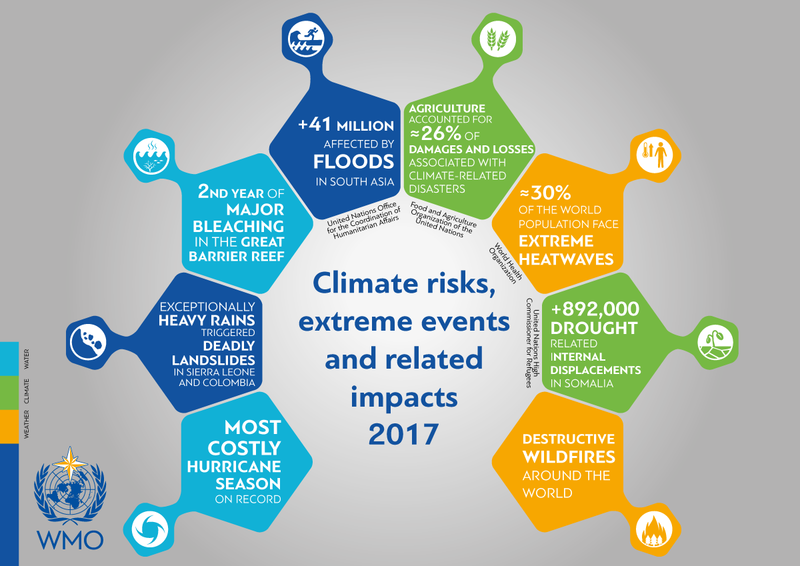 “The start of 2018 has continued where 2017 left off – with extreme weather claiming lives and destroying livelihoods. The Arctic experienced unusually high temperatures, whilst densely populated areas in the northern hemisphere were gripped by bitter cold and damaging winter storms. Australia and Argentina suffered extreme heatwaves, whilst drought continued in Kenya and Somalia, and the South African city of Cape Town struggled with acute water shortages,” said WMO Secretary-General Petteri Taalas.